WWE #21 review: A 'Phenomenal' tale – AiPT! Before the evening of January 24, 2016, there was one wrestler in the world who was considered the best to have never* been in a WWE ring. One man who traveled the world making his name, winning nearly every championship available. A man who helped cement the legacy of the most popular international faction since the days of D-Generation X and the New World Order. That night, everything changed for that one man from Gainesville, Georgia and for the entire wrestling world. That night, AJ Styles entered the WWE Royal Rumble and a new stage of his historic career. 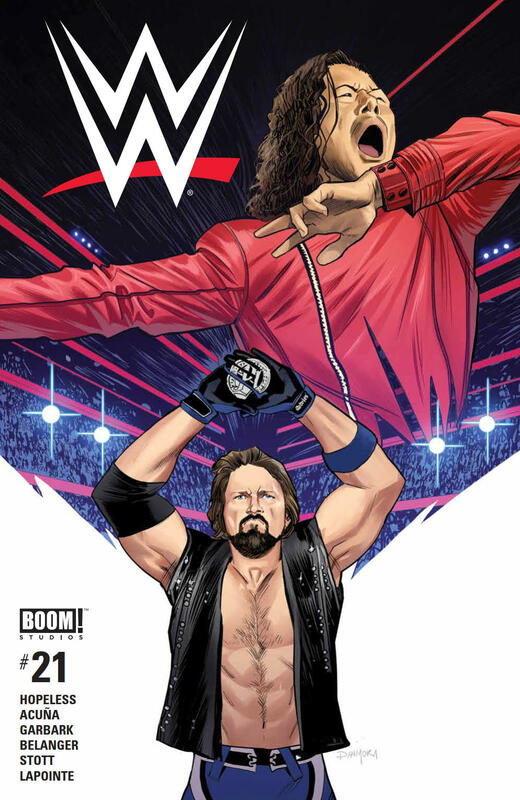 In WWE #21 from BOOM! Studios, Styles’ journey to the big time is chronicled in a more or less true biography worth the moniker Styles himself has earned: Phenomenal. In keeping with his now pitch-perfect balance of kayfabe and real life, writer Dennis Hopeless tells a story of hard work, redemption, and clandestine boat rides into international waters, starting and ending at that fateful night in Orlando, Florida, flashing back to his near 20 years in the business. From his debut in the soon-to-be-shuttered WCW, to his cup of coffee in WWE in 2002, to the independent (TNA) circuit, and finally to New Japan Pro Wrestling, where his time with The Bullet Club put the phenomenal one over the top of a world stage. Of course, being a WWE comic, other promotions are not mentioned by name, but having several pages dedicated to Styles and his partners in Japan, Luke Gallows and Karl Anderson, shows where his mark was truly made in WWE’s eye at least. I’ve mentioned in past reviews of WWE and WWE: NXT comics, I’ve mentioned the revolving door of artists on the books and how it is a detriment to the final product at times. With little consistency between books, it is tough to do more than tell one-shot stories. Artist Serg Acuña has put together one of the best of these books in terms of general aesthetic as well as accuracy of the characters’ looks. These are people we see on TV every week and unless the comic is a cartoonish adaptation (which can work), the characters have to be recognizable as themselves. Honestly, my favorite part of the entire comic was the meeting in International Waters between Styles and Triple H, where Hunter tries to bring AJ into NXT, similar to how Finn Balor and Samoa Joe were brought in. AJ turns down The Game and just motors away in his little boat, presumably back to Japan. Where’s the WWE Network special on this meeting? Why isn’t Dennis Hopeless working for WWE Creative??? For even casual fans, BOOM! Studios comics are where the real story is happening. The frame story of the 2016 Rumble works, but I would have preferred more exploration of his WWE career since.